Jack Nicholson, Larry David and Ben Stiller have had a heck of a good time playing middle-aged curmudgeons with a problem against anything modern, and the type of part happens to fit quite well on Woody Harrelson, too. Harrelson is in nerdy plaids and dons horn-rimmed glasses as Wilson, based on the Daniel Clowes graphic novel, and the gabber and judgmental nutbag that he is goes up to strangers on the street and starts blasting his unwanted opinions at them (the hardest I laughed at the movie is when he awakens a commuter on a train and assaults him with a critique of his white collar conformity). 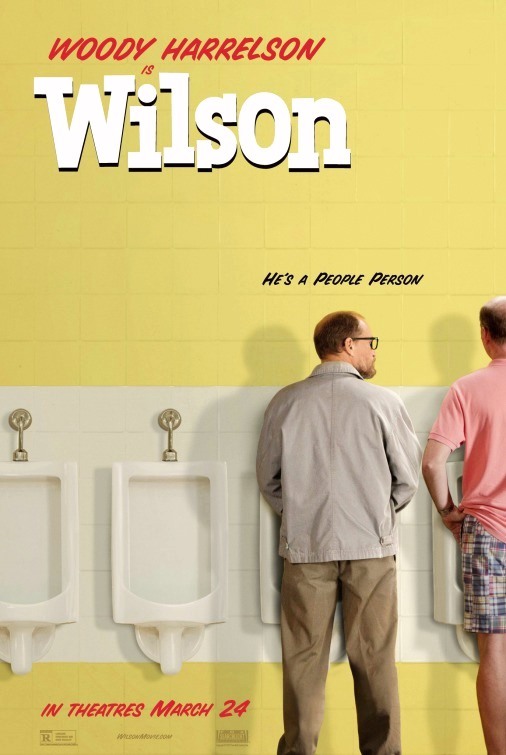 The comedy is rooted in how insensitive Wilson is to the new culture around him, and I say new, because Wilson seems to be stuck somewhere from the past, from I dunno, the 1970’s. I felt immediately emboldened by Wilson’s political incorrectness, and yet that faded fast. Somehow the movie as a whole just doesn’t seem to click. It’s kind of sadly disappointing that I couldn’t find a way to like this movie, at least not more than some of its bits and pieces. The story gets muddled by one of those “revelations” that Wilson has a long-lost daughter. And his ex-girlfriend (Laura Dern, hilarious as someone who has rebound from being strung-out) as the one who gave birth and then gave the baby up for adoption many years ago, abets him on a mission to reconnect with his progeny. “Wilson” handles this pro forma plot differently than other movies, but still, I’ve seen this plot from so many other movies. When Wilson ends up taking his daughter – now 17 and obese and lacking self-esteem – on a weekend trip, it’s not exactly legal. Harrelson with the compulsive fire in his eyes is as good as can be during any plot swing, but I can’t help feel that he was too different, too easily molded into a different character than the one he was playing for the first twenty minutes of the movie. He’s softened and too suddenly sentimental. Craig Johnson, the director previous of the nice little dramedy “The Skeleton Twins,” includes run-on shots that don’t seem to belong, like he couldn’t accept the idea of cutting them. My main quibble, though, is for all his fall from grace, Wilson turns out to be quite a lucky schmo. Larry David would take the same luck and f*#$ it all up. It’s funny how that even though I liked seeing Harrelson in this type of role, the movie itself felt like a chore I had to get through. Cliched plots with trite denouements will make me feel that way. 94 Minutes. Rated R for language. Film Cousins: “As Good as it Gets” (1997); “Ghost World” (2001); “Whatever Works” (2009); “Greenberg” (2010).